Our refurbished Motorola MC55 devices give managers and task workers everything they need to take instant action anywhere. Pure business on the inside and smart styling on the outside. 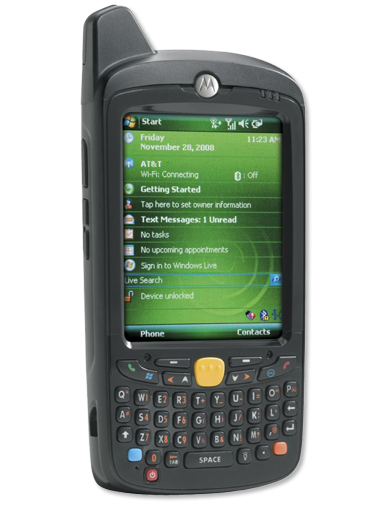 The Motorola MC55 rugged mobile computer for enterprise lets your workers access business applications, scan barcodes, snap a photo, view a video and place a private or push-to-talk call to virtually anyone in your facility. Contact us today about buying, servicing, renting or selling Motorola MC55 gear! Our refurbished Motorola MC55 units bring a new level of functionality and flexibility to pocket-sized mobile devices. As the smallest and lightest Motorola rugged EDA, the Motorola MC55 packs the power of a cell phone, bar code scanner, camera, walkie talkie and mobile computer into a robust business class device with true consumer styling and ergonomics — and is designed to meet mobile worker, business application and IT requirements. Contact us today about buying, servicing, renting or selling Motorola MC55 gear!